Wednesday night is vegetable box delivery night. This is a fairly new thing for us in Australia, although we had used vegetable box delivery schemes in the UK. Last night was our third delivery, and we’ve decided to make it a regular weekly thing. Our first veg box delivery. Completely plastic- and actually all unnecessary packaging- free! Week two veg box delivery. 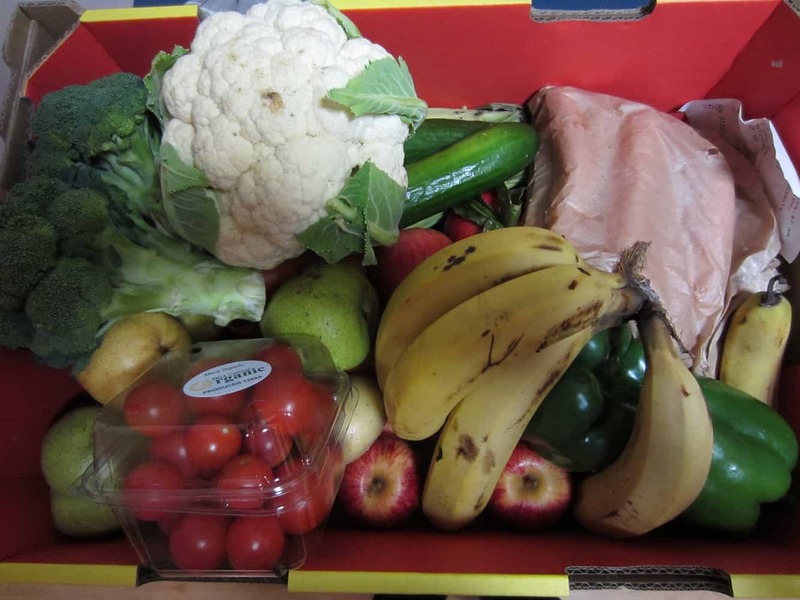 Our empty produce box is collected by the supplier when the new box is delivered so that they can be re-used. Week three (last night’s) veg box delivery. This is the second week we’ve received pesky plastic tomato punnets, so I called the suppliers and asked them not to include any plastic in future. They are happy to help. Wouldn’t it be great if you could phone your local supermarket manager to tell them that you don’t want any of your products in unnecessary plastic packaging, and they would actually do something about it?! 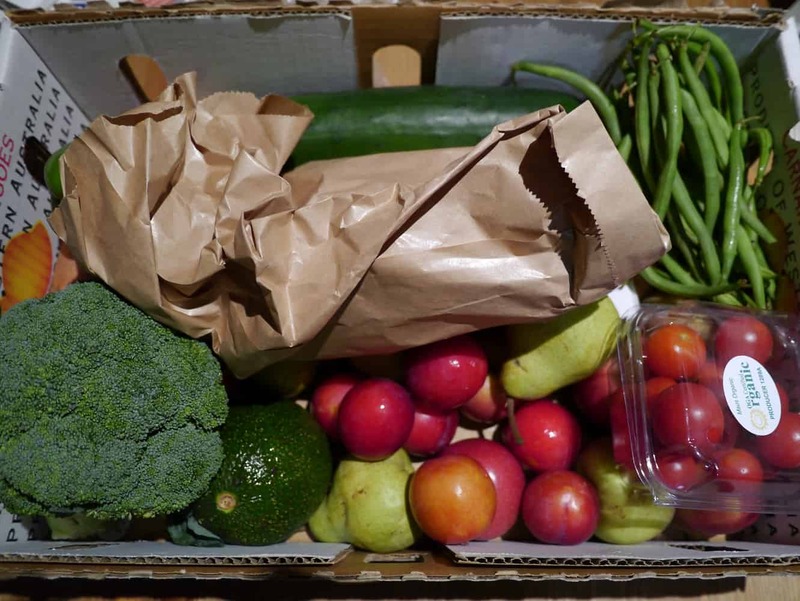 So what is a veg box scheme anyway? Well, it’s a box of vegetables (and maybe fruit) that is delivered to your door, or to a collection point where you can pick it up. But it’s not just a box of vegetables. Produce is usually locally produced and organic, meaning lower food miles, increased freshness (as it usually comes straight from the farm to your door), and free of pesticide residues. Packaging is usually minimal and often biodegradable. It is a great way of supporting independent growers and the local economy. Our box is delivered by the Organic Collective, one of a number of Perth companies that we could have chosen. Prices start at $30 for the cheapest box, and go up in $7.50 increments, with a $3 delivery/admin fee. If you live outside of Perth, and especially outside Australia, you’ll find that boxes are significantly cheaper than this. The guys at Organic Collective don’t tell customers in advance what they’ll be getting, so when the box arrives it’s a little bit like Christmas! If you just can’t wait until the evening delivery, you can call and they will tell you what is in that day’s box. You can also tell them if there’s something (or several things) that you don’t want, and they’ll make a note not to put this in. In fact, when I signed up they called me to find if there was anything I didn’t want, and whether I had any questions. You don’t get that kinda service from the supermarkets! I love our veg box! I just don’t know why I didn’t think of getting one sooner. 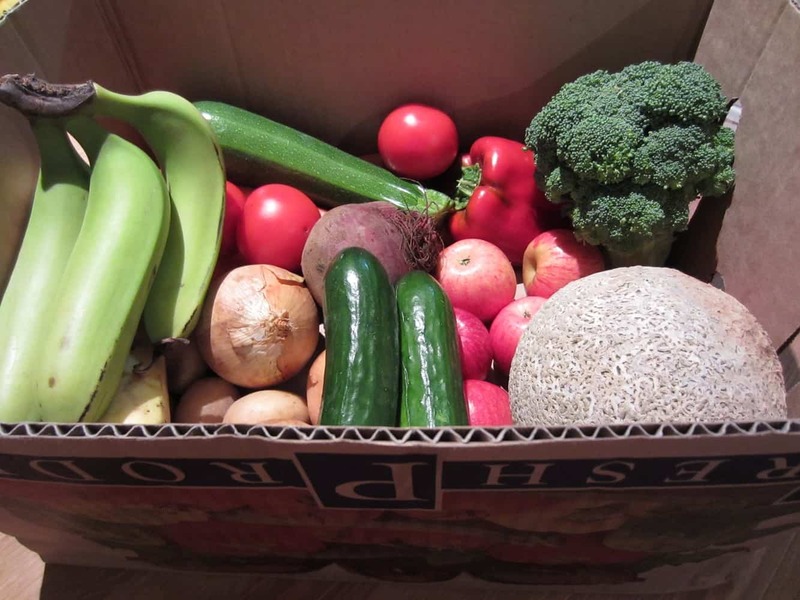 Whether you shop at supermarkets or farmers markets, there are so many reasons to sign up for a box delivery scheme. Locally produced vegetables delivered directly from the farmer to your door are going to be much fresher than vegetables that have been trucked long distances from the farm to a distribution centre and on to a supermarket where they sit on the shelves for days. This also means that they will last much longer at home than equivalent supermarket produce. Having a veg box delivered to your door means you don’t have to spend your weekends in the supermarkets or getting up at the crack of dawn to get to the farmers’ market before everything sells out. If you don’t have your own transport, it definitely beats lugging half a tonne of vegetables home on the bus! Some schemes also offer grocery, meat and or/dairy items so you can get everything you need for the week. Supermarkets stock only a fraction of the total varieties available of different fruits and vegetables that are grown. It is estimated there are 7500 varieties of both tomatoes and apples – how many varieties have you seen in your local supermarket? Supermarkets choose varieties on appearance, yield and shelf life, not taste. You’re much more likely to find unusual heirloom varieties in veg boxes, with much more flavour than supermarket produce. Veg boxes sometimes contain things you’ve never even seen before. I’d never seen a kohlrabi until I received one in my UK veg box – you certainly couldn’t buy them in the supermarket. It’s also a great way to try out new recipes, and you learn to be inventive with what you have. Choosing to buy products with lower food miles means less fuel is used in its transportation, which reduces road traffic, noise and airborne pollution. Providing a market for local producers also supports smaller businesses, and allows farmers to receive a fair price for their products – supermarkets are notorious for squeezing producers to maximise their own profits. Packaging is usually minimal too, so there’s less waste. Want to sign up to get your own delicious fruit and vegetables delivered to your door?! To find out what schemes operate in your local area, simply google ‘veg box scheme’ and see what comes up. You could also try asking friends and family whether they have any experiences. Farmers markets may also be able to provide information. Be careful not to choose solely based on price. What one supplier considers a ‘small’ box may be a completely different size to the ‘small’ box at another. If a box has a large number of varieties, they will probably be in smaller quantities than in a box with only a few varieties. Flexibility also varies and some box schemes will allow you to choose items or tell them things that you don’t like, whilst others will not. Delivery times and days will differ between suppliers. If you leave for work early in the morning, having your box delivered at 7am and sitting in the sun all day is probably not going to work. Payment options will also vary – some will let you pay cash on delivery, others will accept credit card payments. You may be able to set up an account and pay monthly. Some veg box schemes will also deliver other groceries, dairy and even meat. This may be useful if you want to avoid the supermarkets altogether. Vegetable boxes offer seasonal produce, so the time of year will make a difference to the contents. In the UK, winter boxes are predominantly filled with potatoes, carrots, and cabbages, whereas the summer boxes are far more varied and interesting. If boring winter vegetables really aren’t your thing, consider just getting a box for the summer months when the produce is more exciting. When i shopping vegetable keep some point in my mind. The first point is freshness, second one is varieties and the last one is quality. We always want to buy fresh fruit.